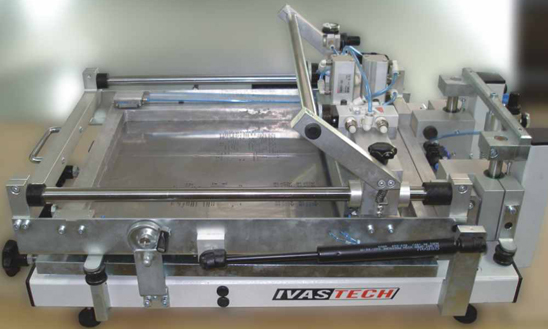 The New SPM100, manual stencil-printer from IVAS Tech, is designed for "middle" and "small" volume production sites. Capable of precise printing of fine-pitch components down to 0,4 mm/16 mill pitch. The Linear bushing guidance ensures vertical separation of the template from the PCB without blurring. The adjustable print pressure of the double squeegee as well as the possibility of the adjustment of the squeegee angle ensures precise printing. Reliable, easy for use and maintain. SPM's low cost, flexibility (under 5 minutes fast changeover) makes our stencil-printer suitable for small series of PCB's, designer teams or handling of more than one Pick and Place machines.